Welcome to the Sisters of Bon Secours USA website! Our revised pages can connect you to the ministries of our sisters here in the United States as well as around the world. Sisters of Bon Secours arrived in the US in 1881 at the invitation of Cardinal Gibbons. Since that time, we have been called to a variety of cities around the country and to a variety of ministries all with a focus of being “Good Help to Those in Need.” Throughout the years our ministry has been faithfully connected with the healing ministry of Jesus and to the intent to help bring people to wholeness. On our archives pages you’ll find more about our rich history. We also invite you to browse the pages highlighting our volunteer ministry and our associates. Find out how you can join us as a sister, as an associate or in prayer. Join us as we “commit ourselves to defend and care for all of creation; and to cry out with others against injustice and all that diminishes life on Earth.” Again, welcome, we hope you will visit this site often. We invite you to pray with us, live with us in community, join us as an Associate or Volunteer and serve with us, sharing our charism of healing, compassion, and liberation. How is God calling you to Join? 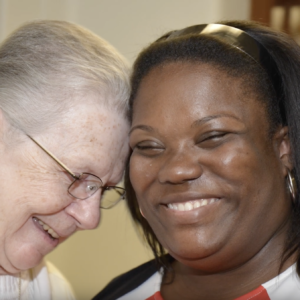 Today, we, Sisters of Bon Secours practice our healing and spiritual ministry in hospitals, hospices, wellness centers, clinics, parishes, long-term care facilities, home care, community centers, social service organizations and the Retreat & Conference Center. We are caregivers, spiritual directors, chaplains, administrators, community organizers, counselors, board members, and more. Whether you're just starting your journey to explore religious life, are discerning, or seeking prayer in general, we offer many resources to inform and guide you with your life's mission. The Associates of the Sisters of Bon Secours were formed to broaden the scope of the laity's participation within the community of Bon Secours and the Church. Associates share the mission of the Sisters through prayer, service and creating faith community. The Bon Secours Volunteer Ministry provides the opportunity for recent college graduates – women and men – to participate in the Sisters' commitment to justice in radical solidarity with the poor, the suffering, and those most in need. The Next Generation of Good Help to those in Need. Bon Secours Young Adults are a community of people in their 20's and 30's, single and married, centered in relationship with Jesus Christ and committed to being the Good News of compassion, healing, and liberation. Come join us in faith, service, and friendship. What do you imagine when you think about Sisters? What is religious life all about? Find out by spending time on our site journeying with some amazing religious women while exploring resources to help you discover your own calling in life.